In July 2011, Iranian president Mahmoud Ahmadinejad appointed Maj. Gen. Rostam Qassemi of the Islamic Revolutionary Guards Corps (IRGC) as oil minister, bringing the number of former IRGC officers in his cabinet to twelve out of eighteen. Yet the IRGC's seizure of the Oil Ministry could have far reaching economic, political, and strategic implications. 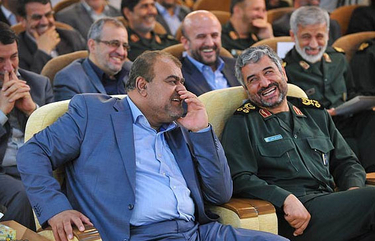 A powerful member of Iran's Islamic Revolutionary Guards Corps, Rostam Qassemi (left, with IRGC chief Mohammad Ali Jafari) inherited Iran's ailing Oil Ministry portfolio in July 2011. In his decree, Ahmadinejad urged Qassemi to work for "the creatures of God" and the "material and spiritual progress" of Iran but said little about the problems facing Iran's aging oil industry as a result of international sanctions, which have imposed crushing financial and technological restrictions on Tehran's ability to boost production in oil and gas fields, particularly those shared with neighboring countries. These problems are not only likely to affect Iran's economy but could increase tensions between Iran and its neighbors, which are free to extract ever greater amounts of oil and gas along their borders with the Islamic Republic. These problems are likely to grow worse under Qassemi, for whom the interests of the IRGC outweigh the interests of the Iranian state. Having won lucrative energy development contracts as a direct result of diminished foreign investment, the IRGC has little incentive to seek an escape from crippling economic sanctions by scaling back its nuclear ambitions. Qassemi was born in 1964 in Sargah village in Fars province and is believed to have a degree in civil engineering. He joined the IRGC in Kharg Island in 1979 and was appointed logistics chief in Bushehr province two years later. After Iran's war with Iraq (1980-88), Qassemi directed the engineering activities of the IRGC in Bushehr. In 1996, he was appointed chief of the IRGC navy's Nouh base. In 2007, Qassemi was appointed chief of Khatam al-Anbia (seal of the prophets), the IRGC's main engineering firm and one of the country's largest development contractors. Khatam al-Anbia has built dams, highways, and pipelines for water, gas, and oil. Like other IRGC firms, it has reaped a windfall of no-bid contracts as foreign oil companies have withdrawn from Iran's oil and gas sector. In May 2010, Khatam al-Anbia was awarded several phases of the South Pars gas field. According to Ahmad Qal'ebani, then National Iranian Oil Company (NIOC) director general, Khatam al-Anbia had signed $25 billion worth of contracts with the NIOC as of July 2011. The firm's engineers are reportedly involved in the construction of intermediate-range missile launch pads in Venezuela. Khatam al-Anbia's growing penetration of the Iranian economy and alleged involvement in Tehran's nuclear program led to Qassemi being explicitly named in U.S. and European Union sanctions. There is some indication that Ahmadinejad's preferred candidate for the job was acting oil minister Mohammed Ali-Abadi, whom he appointed as caretaker in early June 2011. Having no prior experience in the energy sector, however, Ali-Abadi faced withering parliamentary criticism. Hamid-Reza Katouzian, parliamentary Energy Committee chairman, called Ali-Abadi "the worst imaginable candidate" for the Oil Ministry. Ahmadinejad was forced to cast about for an alternative. The IRGC lobbied hard for the candidacy of Qassemi. Neda-ye Enqelab, a media outlet close to the IRGC, disclosed that Qassemi conditioned his acceptance of the cabinet position on a "purge of the forces close to the current of deviation [individuals close to Esfandiar Rahim-Mashaei, Ahmadinejad's chief of staff and close confidante] from the oil industry." This suggests that Qassemi was essentially imposed on the president. Opposition to the appointment of Rostam Qassemi as oil minister is not opposition to his person … I distinguish between his person and his legal position since his person is commendable… The main issue … is that the IRGC as a military force should not be connected with the political and economic power. In other words, the IRGC should not be [a part of the] cabinet … The IRGC is the symbol of the unity of society, just like the clergy. The Guards belong to all classes of society … Now, the IRGC is—rightly or wrongly—accused of seizing development projects in unequal competition with the private sector … the great oil infrastructure being added to it will not do away with such accusations. I arranged a meeting and invited representatives of the private sector. They all believed that the Khatam al-Anbia base is distributing work among them and that Mr. Qassemi, rather than competing with the private sector is supporting it. Larijani also said that Qassemi was appointed "as an individual of the Guards … It would be wrong to interpret this as the Guards trying to seize political power." Though the sanctions have not dissuaded the Islamic Republic from accelerating the development of its nuclear program, they have created severe problems for its oil industry. An August 2011 report issued by the U.S. Government Accountability Office concluded that foreign firms have "significantly decreased commercial activity in Iran's oil, gas, and petrochemical sectors." Qassemi is well aware of the dire state of the Iranian oil industry. He has made it clear that boosting production in the twenty-eight oil and gas fields Iran shares with its neighbors is his highest priority. According to one report, 50 percent of Iran's gas reserves are to be found in these shared fields. Unencumbered by sanctions, Tehran's neighbors extract oil and gas from shared fields at a far greater pace. While Iran extracts 210 million cubic meters per day from the South Pars gas field (the largest in the world) it shares with Qatar, the emirate extracts 360 million cubic meters of gas from it. Iran's production from shared oil fields experiences similar problems. Iraq extracts 295,000 barrels per day (b/d) from the twelve fields it shares with Iran while Iranian production from the same fields is 130,000 b/d. In the four oil fields it shares with Saudi Arabia, Tehran produces 42,000 b/d while Saudi production is ten times that. The United Arab Emirates extracts 136,000 b/d from fields shared with Iran while Iran extracts 56,000 b/d. At his inauguration ceremony, Qassemi called the development of shared fields his "top priority." According to an unnamed Oil Ministry official, substantially boosting oil and gas production sharing from these fields will require $67 billion in investment. Qassemi maintains that only $50 billion is needed, but the Iranian state can afford neither amount. Qassemi is likely to find it difficult, if not impossible, to attract foreign direct investment in Iran's oil and gas sector or persuade foreign companies to bring in much-needed technology. He has warned Chinese companies against further delays and suspensions of contracts signed with Iran, threatening to replace them with IRGC construction firms. However, such attempts at attracting investments and technology have yet to produce results. The Oil Ministry's efforts at releasing "participation bonds" to attract domestic investment in Iran's oil and gas fields is more a symbolic act than a serious attempt at raising capital. The IRGC, whose aggressive pursuit of nuclear weapons provokes foreign sanctions against the Islamic Republic, also benefits from the sanctions, which eliminate foreign competition. Khatam al-Anbia and other IRGC firms may prove incapable of living up to their contractual obligations, but in the meantime, the IRGC has achieved its main goal: access to Iran's foreign exchange reserve. Once that tap is turned on, it is difficult for opponents of the IRGC to turn it off. As Iranians watch their neighbors reap profits from shared oil and gas fields, disputes over resources and territorial boundaries can quickly escalate as was the case in 1999 when Iranian troops entered Iraqi territory following a disagreement over the shared al-Fakkah oil field. Should tensions rise concerning Iran's shared oil and gas fields, the IRGC may play the nationalist card and mobilize the Iranian public against "Arabs" who "take Iran's oil." The Islamic Republic has yet to learn that avoiding international sanctions and diplomatic isolation provides a more suitable pathway to becoming a responsible regional power than recklessly flexing military muscle. Time is running out for civilian leaders who seek to buy the IRGC's political support by showering it with black gold. If anything, Qassemi's appointment may indicate that it is too late for the civilian leadership to free itself from the IRGC's claws. Ali Alfoneh is a resident fellow at the American Enterprise Institute. "Hokm-e Reis-Jomhour Bara-ye Rostam-e Qassemi Be Onvan-e Vazir-e Naft," Paygah-e Ettela'e-Resani-ye Dowlat (Tehran), Aug. 9, 2011. Mashregh News (Tehran), July 27, 2011. Daneshjou News (Tehran), July 29, 2011. Abrar (Tehran), Mar. 16, Apr. 19, 2010; Poul (Tehran), June 5, 2010. BBC Persian (London), July 31, 2011. The Jerusalem Post, May 17, 2011. "Alphabetical Listing of Specially Designated Nationals and Blocked Persons," United States Department of the Treasury, Washington, D.C., accessed Sept. 18, 2011. RTT News (Williamsville, N.Y.), Aug. 3, 2011. Asr-e Iran (Tehran), June 2, 2011. Fararu (Tehran), June 3, 2011. Neda-ye Enqelab (Tehran), July 27, 2011. Naft News (Tehran), Aug. 3, 2011. Asr-e Iran, Aug. 3, 2011. Mehr News Agency (Tehran), Aug. 3, 2011. "Firms Reported in Open Sources as Having Commercial Activity in Iran's Oil, Gas, and Petrochemical Sectors," U.S. Government Accountability Office, Washington, D.C., Aug. 3, 2011. Mehr News Agency, July 18, 2011. Asr-e Iran, July 13, 2011. SHANA (Tehran), Aug. 9, 2011. Islamic Republic News Agency (IRNA, Tehran), Aug. 25, 2011. Diplomasi-ye Irani (Tehran), Aug. 14, 2011. Kayhan (Tehran), Aug. 23, 2011. The Wall Street Journal, Dec. 19, 2009. Related Topics: Iran, Oil & Gas | Ali Alfoneh | Winter 2012 MEQ receive the latest by email: subscribe to the free mef mailing list This text may be reposted or forwarded so long as it is presented as an integral whole with complete and accurate information provided about its author, date, place of publication, and original URL.